Slide into a ton of fun! Who doesn’t remember going to a fair or carnival as a kid? And who could forget sliding down the big plastic slides on a burlap sack? Well at Deborah’s Party Rentals we can bring you the thrill of the slide without the burlap sack. 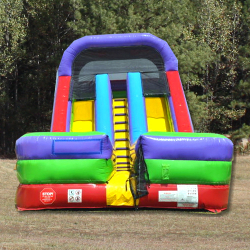 Check out these exciting, brightly colored inflatable slide rentals. They are sure to be the centerpiece of your special event. 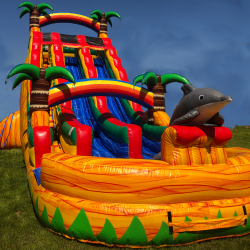 Our inflatable slide rentals come in a variety of configurations that are sure to thrill your guests. We’ve got both wet and dry slides. Want to cool off your guests during that hot Alabama summer? Rent one of our slides with a pool of water at the bottom like the Double Splash or Corkscrew Fire with pool. We’ve got single lane and twin lanes. 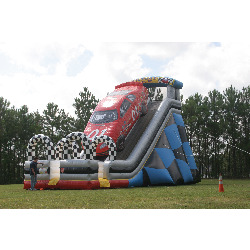 Try one of our twin lane inflatable slide rentals to bring out the competitive side as the kids get to see who’s the fastest. Prefer a slide that meets your particular party or event theme? We’ve got the Victory Lap NASCAR slide, Catch-A-Wave slide, and even an Old Woman in the Shoe slide for the younger kids. 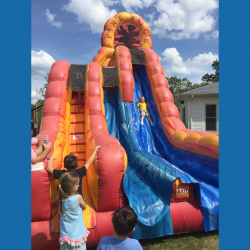 Our slides come in sizes from 18 to 29 feet so we’ve got just the inflatable slide rental to fit your event. 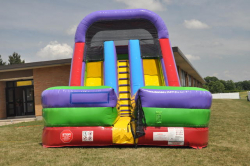 We have a huge selection of moonwalks, bounce houses, carnival rides, carnival games, tents and much more! We serve Birmingham, Hoover, Vestavia, Mountain Brook, Alabama and surrounding areas. Give us a call today at (205)631-2670, we would love to help you plan your event. Need ideas for summer party ideas, check out our blog.